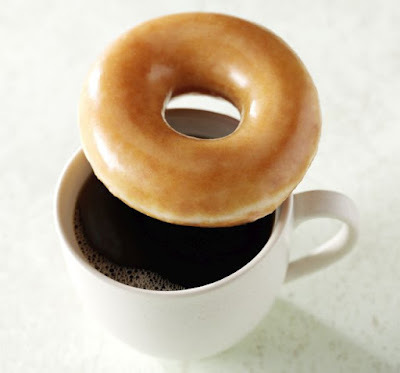 Krispy Kreme has gone back to the drawing board and come up with new brewed coffee and will be giving a free Original Glazed donut with the purchase of any size cup of coffee. The new coffee is meant to complement Krispy Kreme's donuts and is available in two new blends: Smooth and Rich. The Smooth blend is described by the chain as "lightly roasted with a subtle blend of Central and South American beans" for "a smooth, balanced body for easy drinking and a naturally sweet finish." Rich blend is described as "an aromatic and flavorful medium-bodied blend of Central, African and Indo-Pacific beans, creating a lush, well-rounded flavor and satisfying finish." The free donut deal is available at participating locations from February 6, 2017 through February 28, 2017. The new coffee replaces Krispy Kreme's House and Dark blends, which were first introduced back in 2011.